Established by Jonathan Stephenson in London’s West End in 1994, Rocket Gallery grew out of his typography, printing and publishing company The Rocket Press, which itself was founded in 1981. In 2005 Rocket moved to a newly-converted gallery space in London’s creative East End. Over the last decade the gallery has forged an international reputation for its particular vision of minimal painting, sculpture, photography and design. The artists and designers who work with Rocket investigate the areas of crossover between art, architecture and design. Design exhibitions in the last four years have included the first-ever show of 1950s Krenit bowls by the Danish designer Herbert Krenchel; a mini-retrospective of mid-century furniture by the Danish-born American designer Jens Risom; a dialogue show of vintage Poul Kjaerholm furniture with contemporary three-dimensional paintings by Meg Shirayama; 'Merger', a show of minimal painting and furniture; and 'Book a table', specially commissioned coffee tables paired with artists' books. 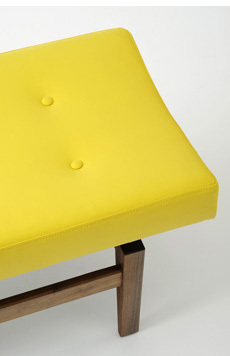 In recent years Rocket has started to collaborate with designers and manufacturers on the release of furniture. Our first collaboration with Benchmark, the Hexad table by Tomoko Azumi, won a 2010 Wallpaper Design Award. Founded by Sean Sutcliffe and Terence Conran in 1983, today Benchmark Furniture is one of the most technologically advanced furniture-making companies in Britain with 3,500 square metres of workshop space in rural Berkshire. They employ over 45 craftsmen and designers and run a renowned apprentice scheme to train young woodworkers in cabinet making and joinery. Benchmark also owns Litton Furniture in Dorset where many of these Risom pieces are made.. Benchmark's own furniture range includes pieces by Tomoko Azumi, Terence Conran and Thomas Heatherwick. For ‘contract’ commissions Benchmark works with major architects and designers on restaurant, hotel, museum and college developments – recent projects include the Albion Cafe and Boundary Hotel in Shoreditch. Benchmark have a Queen’s Award for Enterprise in Sustainable Development.